It is no secret how much I enjoy shopping at the open air market. As a family who goes through a lot of produce, I hate paying supermarket prices for produce when I can get it all for a fraction of the price. Because I regularly go to the open air market, I develop a relationship with many of the sellers, who get to know me as someone who loves a good bargain, and they offer me better bargains than they offer everyone else, sometimes. This last time I went to the market was no exception. Gideon is my favorite produce guy, because he has great prices on his produce, and despite it being reduced rack/seconds, often it is in better condition than the stuff I find in my local mom and pop's grocery store. Oftentimes Gideon, in a rush to clear his stall, offers me super low prices per pound on produce if I take the last of a certain type of food, and sometimes towards the end of the day just gives me bags of things for free. When I got to Gideon's stall, I saw he was selling leek, fennel, beets, and zucchini, all vegetables I love. Everything but the leek was being sold for less than 35 cents a pound- leek was being sold at a good rate, but I don't remember exactly how much it was. I filled up my bags with beets, fennel, zucchini, and red peppers and then Gideon tried to convince me to get leeks, and ended up giving me two shopping bags filled with leek for around $4. But when I went to weigh my vegetables, Gideon told me that if I take the rest of his fennel and the rest of his bell peppers, he'd give them to me for next to nothing. 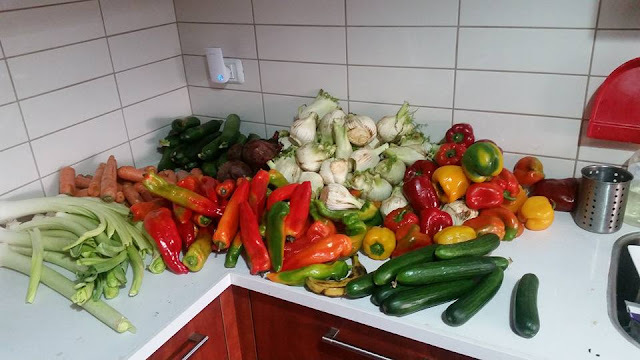 I honestly don't know how many pounds of vegetables I got from him, but in the picture, you can see how much produce there was- all but the cucumbers (front right) and carrots were from him. And I paid $11.42 for that. Then because I needed cucumbers and carrots, that Gideon didn't have, I went to another stall and got perfect cucumbers that were for some reason being sold at reduced rack prices of 39 cents a pound, and carrots that were perfect other than being broken, for 19 cents a pound. At that stall I paid a total of $2.68. I bought strawberries at the market, as the end of the season is nearing, and I wanted to get some while we still could. I bought 4.4 lbs of strawberries at $1.30 per pound for $5.70. But the strawberries aren't pictured above. Total for my shop at the market? $19.82 total! Total for what was pictured above? $14.11! I think it's clear why I love going to the open air market. There's no way on earth I could have gotten that much produce for that little at the grocery store, even the frugal one. Got any great grocery deals recently? I'm in the U.S. and my latest great deal wasn't nearly as great as yours, but I was happy with it. Giant Eagle, the supermarket chain with locations near my home, sent me a folder of targeted coupons (that is, they used data from my loyalty card to see what I buy most and give me discounts on some of those things) that expired April 29. After several times of not getting to the store when I meant to, I was going to go on April 29--and then I got a new folder of different targeted coupons, as well. So I used something like 20 coupons and bought only a few items that were not on the coupons. I got $2 off a bell pepper and $2 off mushrooms, so that was less than half price for a red pepper (I don't like green peppers, which are cheaper) and I filled a bag with slightly more than $2 worth of mushrooms so that they were almost free. Some of the coupons were for free items: a pound bag of frozen vegetables, a half-pound of cheese, and the cheap white bread (which I normally wouldn't buy, but my 12-year-old loves it, so it's a treat for him!). There were two coupons for $2 off ice cream, and then it turned out that one of those brands was on sale, so I bought that one and paid $1.33 for what's normally $4.99. Overall, I paid $89 for 5 big bags of food and saved about $35 off the usual prices, and aside from the free white bread I didn't compromise any of my standards of nutrition! It really looks like you got some great deals. That's AWESOME! I'm in MI and the closest thing we have to open air markets is the local farmers market(s). Most of the time that means paying almost-as-much-as or more than regular store prices. On the other hand, we do have enough space to garden so that's a plus.